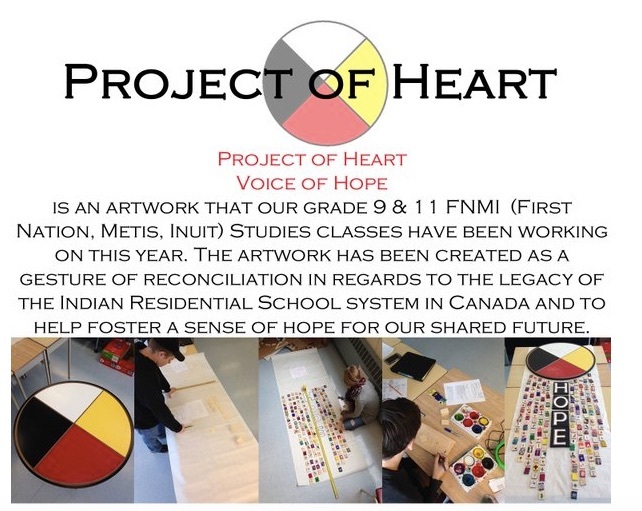 Our school has been working on the Project of Heart over the past school year. Our work culminated into a celebration this morning of the permanent installation of our Project of Heart art work. Please see the first link below for a video of our celebration that was recorded for a Google Hangout for our school board. In attendance there were students who worked on the project, as well as other classes, community members, parents, local township council members, school board Trustees, Superintendents, and Principals. It was a good morning. I am so proud of our students and the work that they have accomplished. Our Voice of Hope Project – students creating videos speaking to their Project of Heart work. Our idea with this project is to have students in each new class complete the Project of Heart and then add to the video collection year after year. More videos to come!